RAMSEY – Being in a community that supports and nurtures soccer players from a young age has its advantage and its drawbacks. Wyckoff and Franklin Lakes have been turning out high-level players for the better part of 30 years now and have kept the Ramapo boys and girls soccer teams in the top tier on a state wide level for decades. If there is a negative, it is that with the way the Academy system has evolved, there is competition for those players’ talents when they reach high school age. Last season the Ramapo girls soccer team was never whole as Nicky Chico and Emerson Elgin spent their sophomore and freshman years, respectively, inside the Academy structure. Had the pendulum not swung back for this season, freshmen Emily Chico and Mary Cochran may never have never put on a high school uniform and the Green Raiders might have been without four elite players. Thankfully, from a high school sports prospective, all four are on the roster and three of them made an obvious impact against Ramsey on Thursday afternoon. With Mary Chico missing out through injury, Elgin scored the first goal, Cochran scored the second and Emily Chico was a key piece to the defensive puzzle that helped Ramapo win the battle of possession in a 2-1 victory on the turf at Creamer Field behind Ramsey High School. With so much extra firepower now available, Ramapo looks the part of a Top 10 (or better) team in the state as it has the speed to get forward, the skill to find feet and the flair to finish. The Raiders tested the Ramsey net early and often before finding the breakthrough goal with the first legitimate look coming in the eighth minute. Pinging the ball around the carpet led to Riley Hourihan making an over-lapping run up the right side before sending in a service on the dead run that Elgin redirected with her head on frame only to see Ramsey keeper Katie Sylvester corral the one-hopper at her right post. Sophomore Kim Ceegan did the hard work for Ramsey’s goal as she drew a penalty in the box in the 76th minute. Ramsey central defender Helene Tyburczy broke up a Elgin cross that might have led to a Cochran tap-in in the 29th minute and, despite absorbing their share of pressure, the Rams, who were by no means out-classed, were just over four minutes from getting out of the first half in a still scoreless tie. It came down to a scrum near midfield that scrambled the formation. Julia DiDimizio won possession and quickly sent in Elgin, who went in 1-v-1 down the left channel and ripped a shot toward the upper shelf at the near post. Sylvester, advancing to cut the angel, did well to get her gloves on the shot, but the ball had enough momentum to continue on its path into the goal as Ramapo took a 1-0 lead into halftime. Sylvester did a solid job of picking off crosses and coming off her line to grab heavy through balls and her best save of the game came in the dying seconds of the first half. Cochran hit a cracker from inside the box that Sylvester turned around the post with a strong wrist and an all-out dive to her right. Sylvester also broke up a centering pass at the end of a Ramapo three-player combination that included Elgin, Lauren Chin and DiDimizio in the 52nd minute. Ramapo (3-0), which has won three straight to start the season, had a goal waved off by a high boot as Chin tried to get on the end of a Mary Clare Langan service in the 54th minute. Ramsey, which beat Ramapo in last season’s Bergen County Tournament semifinal round, is a strong team and program, too, and it was dangerous on the counter attack. 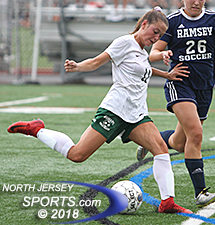 Senior Alexa Correa, a returning first team All-County striker, drew most of the attention from the Ramapo defense and had to come higher up the pitch to get her touches, but the Rams kept at it. Junior Mary Clare Langan, a returning first team All-County midfielder, assisted on Ramapo’s second goal. 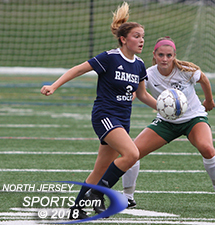 Chloe Gavalakis rolled a square pass across the top of the area that Correa ran onto for a shot from distance that forced a save out of Ramapo keeper Natalie Kologrivov 17 minutes into the second half, but Ramapo doubled its lead 10 minutes later. With Ramsey keeping a high back line in search of the equalizer, Cochran made a perfectly-timed run and stayed onside before catching up to a ball played over the top by Langan, Ramapo’s high-energy midfielder. The whole net was there for Cochran and she chose the low left to put the Raiders up 2-0 with 13:22 left in the game. Before it could coast home, however, Ramapo had to deal with Kim Creegan, a sophomore who showed no fear in testing the Ramapo defense. She made determined runs up the left side all game long, absorbed a lot of contact and finally was rewarded four minutes before the final whistle when she forced a decision from the last defender standing between her and the goal. The result was a take-down in the box, a penalty kick and a conversion by Correa that drew Ramsey back to within one goal and made the final four minutes anything but a formality. Ramsey fell to 1-1 with the loss, but did nothing to diminish its credentials as a contender for a league title and deep runs in the county and state sectional tournaments.